I have decided that autumn is my favourite season. 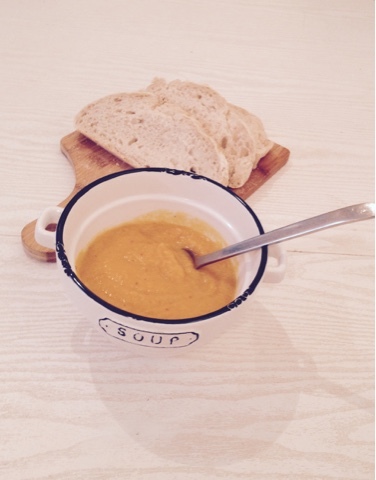 All the best veg are in their prime and for the first time since summer, wearing oversized knits and craving soup are a daily occurrence. 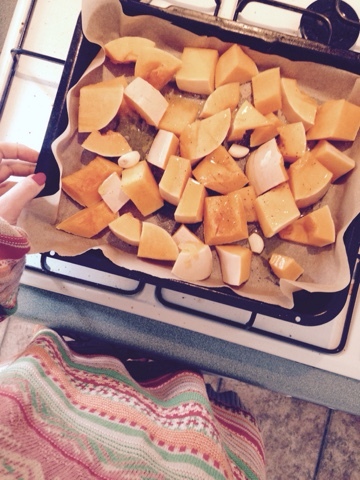 De-seed and chop your squash into chunks (keep the skin on), pop on to a baking tray with your garlic cloves and add a drizzle of olive oil, salt & pepper and put it in the oven. 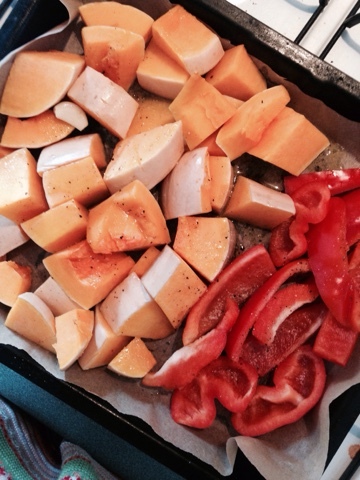 Chop your pepper and and add this to the baking tray - I usually give the squash a head start as it takes longer. This stays in the oven for around 45 mins to an hour. 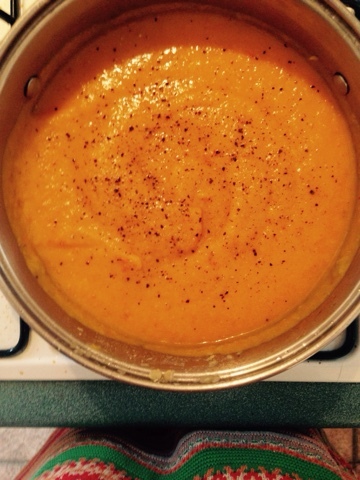 In the meantime cook your red lentils, I cook mine in some stock for a little extra flavour. While this is bubbling away, chop your onion and fry in coconut oil with some grated fresh ginger. After the onions are sauteed and delicious, add your stock and sprinkle of chillies and let it bubble away. Once the lentils are cooked, rinse and add them to the stock, keep it going on a very low heat. 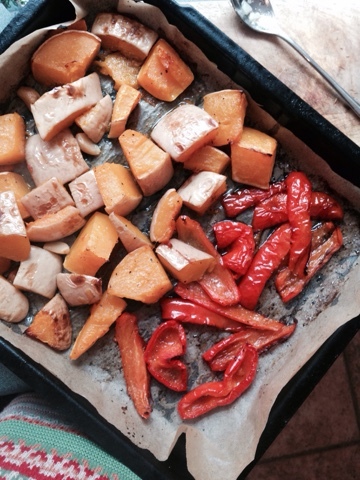 When your roast veg is smelling scrumptious and is nice and soft, throw your squash into the blender and peel the shiny skin off the red peppers leaving them fleshy and full of flavour, throw these in too. Add your stock and blitz away until it's thick and soup like. Pour back into your pan, add some S & P and your good to go. Either heat up straight away or leave it to sit until your ready. Serve with fresh sourdough and salted butter. 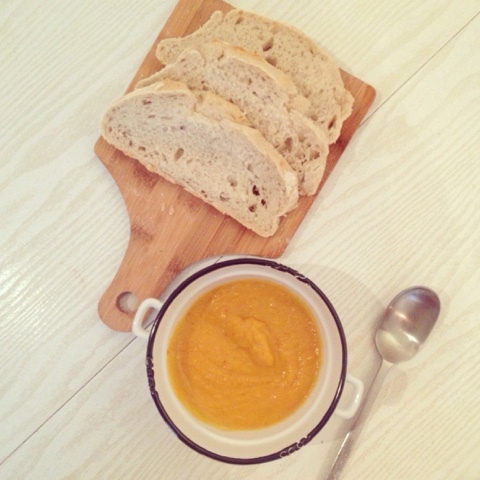 Then all that's left to do is snuggle on the sofa and dunk your warm bread in for the most brrrrilliant, warming meal. Autumn, I like you, can you stay?